Advantages and Disadvantages of Technology in Modern Life. In today’s world, our life is so much influenced by modern technology that we can’t even imagine our lives without them. We are living in this world where we use technology every day for almost every task. Modern technology has an immeasurable impact on our lives. We have all seen how the civilization has evolved due to modern technology. It has revolutionised the ways of living in every possible way right from how we complete our work to how we communicate. Simply stating, modern technology is the extension and advancement of already existing technology as a result of scientific discoveries and developments. Modern technology has always bolstered in enhancing human capabilities and has been evolving over the years. 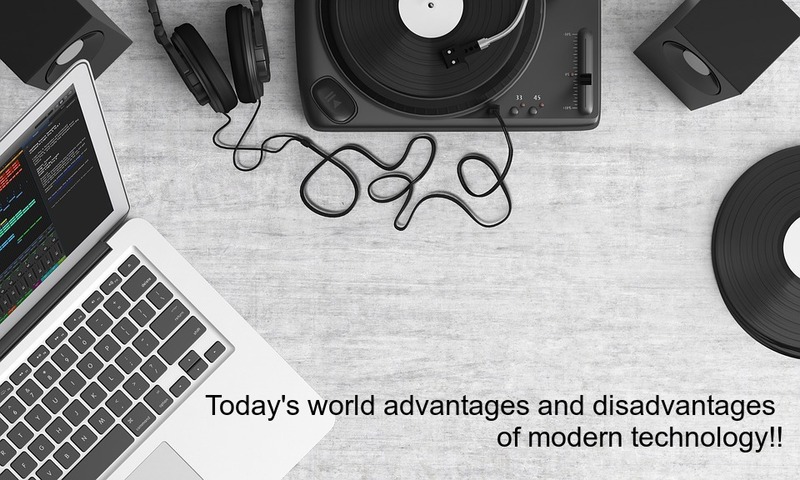 Better Entertainment: Modern technology has a great impact on the entertainment industry. There was a time when a limited number of options were there on which people depend for entertainment purposes. Modern technology has made it possible to bring a plethora of options into people’s homes. Radio, television, video games, online apps, music and visual systems are just a few to name. Communication is improved: Communication is the basis of both personal and professional relationships. We are provided with the advanced communication technology tools these days which are ready to develop our communication. Instant text messaging, free whatsapp calls, skype e-fax machines, e-mail, video conferencing are some of the communication tools to count. Overseas communication has also become easier with many social networking application and various tools. Fostering innovation and creativity: The challenges in technology faced by us, train our brain to use its full potential, in turn enhancing our innovation and creativity. Almost everything is online these days. You can start your business, blog or any other venture sitting at your home. There is a demand of creative works online and people can showcase their talents without going anywhere. Freelancing projects and opportunities are a result of the advancement of technology wherein people can contact each other and collaborate in various ventures. Location is not a barrier if you are skilled enough to deliver the results. Convenience in travelling: – Transportation technology has also gone a long way in making our life simple and fast. With the advancement in technology, it has become easier to travel long distances in a shorter span of time. In today’s fast paced world, these technology advancements are helping people to save their time. Improved lifestyle: Technology has brought a great change in the ways of housing and architecture. Things are getting automated these days with an effort to simplify our lives and improving our lifestyle. This has also helped in improving the security of people in the society. Social Networking: When we are talking about technology, we can’t forget the contribution of social networking which has turned this world in to a global village. It has not only helped individuals to stay in contact with friends and families but also helped people a lot in networking and improving business. Revolutionised the health industry: The advancements in this industry have a great impact on the lives of people. Not only it has reduced the mistakes made by doctors, it has helped patients making an informed decision with the help of many apps available. Disadvantages of modern technology: No doubt, modern technology has simplified our lives in so many ways by making it easier and enjoyable, but sometimes its way of implementation ends up harming many lives. Loneliness: Social isolation has increased a lot as more and more people are involved in online interaction. The number of children playing outdoor games is decreasing due to a lot of options available like video games and apps. Unemployment: No doubt, modern technology has replaced many works done by human beings. Works are being done by machines in more productive and efficient way thus replacing the people who used to work earlier. Competency: In many fields, as we are more dependent on machines, it has resulted in the decrease in our creativity and thinking capability. Mass destruction weapons: Technological advancements have enable people to manufacture modern war weapons which can cause mass destruction and has long lasting adverse effects.